This project is one of the promising project of the year in the real sector of the economy. With real faces, real things and real ideas. The team is representing business which is operated starting from 2014 under the EVABONBONS trade mark. EvaCoin project offers new business model and new level of relationships between management and investors. 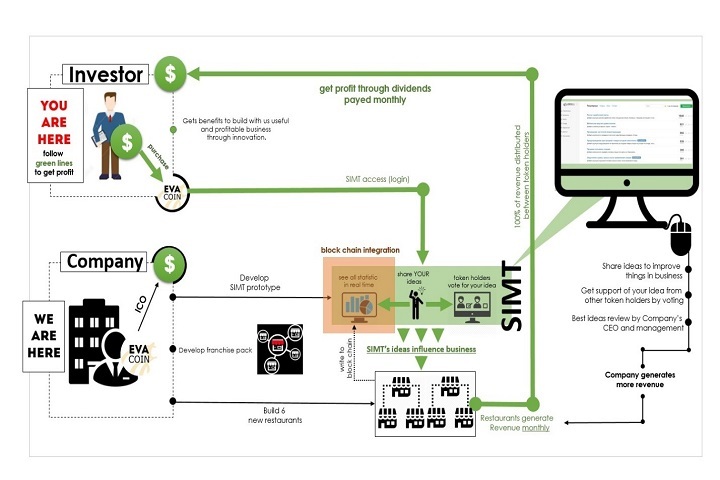 The core idea of EvaCoin is IT tool to enhance efficiency and performance of business processes. a community of users can control how the record of information is amended and updated. Token holders will get access to IT solution SIMT (Smart Investment Management Tool) and will get all key information about business (cost, revenue, rent fees, etc) and business process. Based on this information, investors can do their own analysis and share ideas on how to improve things and get more revenue and profit as a token holder. SIMT provides possibility to get votes of other investors to support single idea. Bring your idea to the CEO. Let’s simply imagine how it will be working for you and us. Just imagine that you are a Starbucks shareholder. And as a shareholder and investor you are interesting to receive true information about company’s activity. Because true information is a basis for correct analysis. Today such information is distributed through periodical reports generated by company’s employees. Now imagine, that all key data is been regularly written to the block chain — to the decentralized database. This information 100% valid and cannot be changed by someone’s decision. Returning to our example with Starbucks — you, as a shareholder, will be getting information in real time. All what you need to do now is to make analysis and to make decisions about your intentions to retain or sell your shares. The next expected question will be — if I can do good analysis why I can’t give advises to the company’s management (even to CEO) on how to improve things in business and rise a share cost? Moreover, get support of other shareholders. So, Company offers you tokens which will give you access to all key information about business which generates money (including financial information, information about management’s decisions, strategy, product production processes and other internal strictly closed information) and have strategic plan for international expand. Also EvaCoin token gives you a chance to share your voice, your opinion or your ideas based on your own analysis of the information which you see in the real time. With SIMT we want to give investors chance to cultivate what they have invested in. Investments will be used to build real things in the real world – build pastry chain cafés, test ideas and processes, prepare franchise pack to expand business to the international markets. Pre-sale has been started in the end of December 2017. Pre-sale and ICO caps are really reasoned and achievable. During pre-sale just 4% of tokens is available. Investors will get a 100% bonus in this stage. During ICO no bonuses available. Bounty also canceled. The team will get tokens in equivalent of the money which has been already invested (~$130k). The funds of the pre-sale will be used for further marketing of the project. EvaСoin has a great dynamic financial model which is available in White Paper. Each 15th day of the month 100% of Company’s operating profit will be distributing between EvaCoin holders via smart contract. The team has great advisors and support of the government. The smart contract and tokens released on Blockchain Ethereum according to the ERC20 standard. The maximum number of tokens is 3450309.